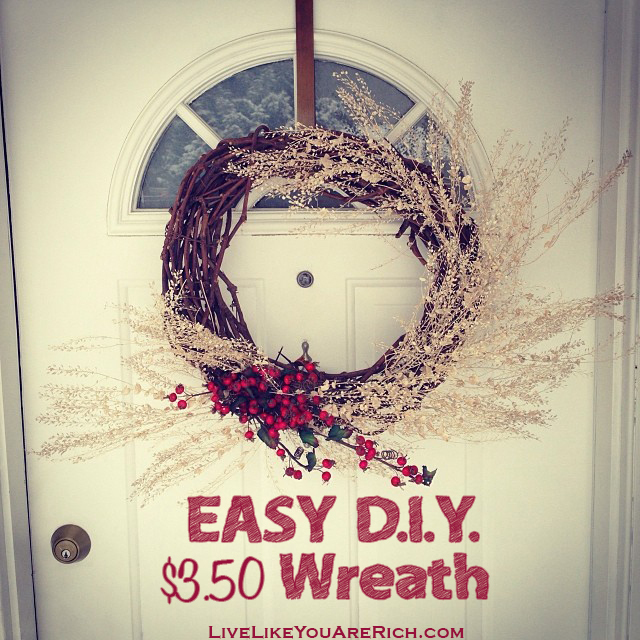 I made this wreath (which I think is pretty cute) for $3.50 in about 30 minutes. #1- Buy an old wreath from a thrift store (I got mine for $1.50) and take off the old decorations/things on it. 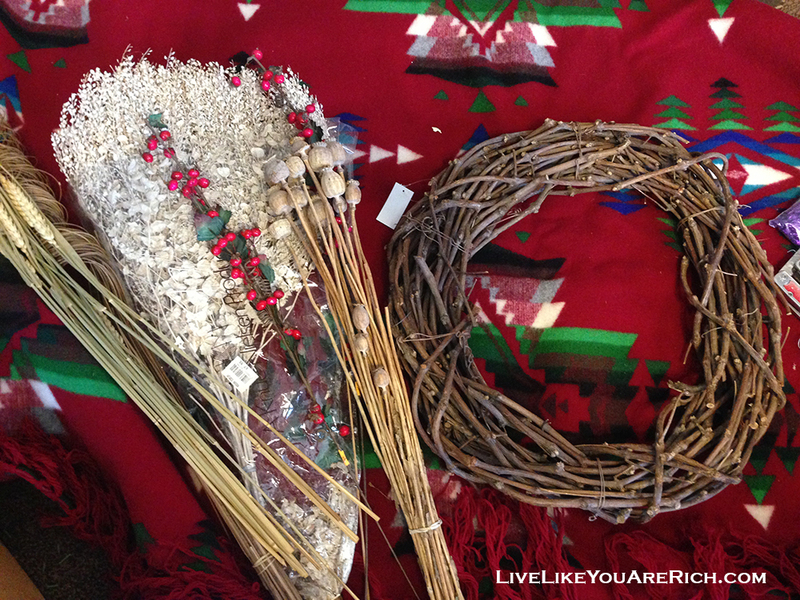 If you have an old wreath sitting around that you don’t love, take off the decorations and you can start anew. 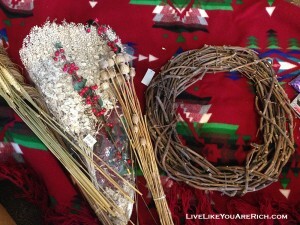 #2- While you are at the thrift store look for vases of fake berries, flowers, filler, etc. that you like. If you can’t find anything and don’t have anything at home, check at a craft store and buy one big bunch of filler and 2 strands of red berries or whatever you like that matches. Almost every craft store has coupons so use them to get the decorations even cheaper (I got my white filler and berries for $2.00 with a coupon). 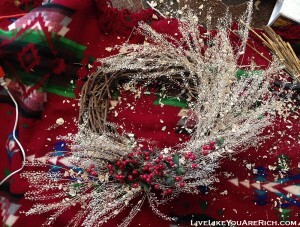 Then begin by simply inserting the filler in the wreath. Arrange as you like make sure to keep the stems as long as possible so you can glue them down from the back. #3- Hot glue the filler/decorations in. I turned the wreath around and glued from the back. I made sure to glue pretty heavily and got most everything glued down from the back. There were a few shorter strands that I glued from the front, such as the berries. If you need to glue from the front, do so strategically so you can’t see the glue. 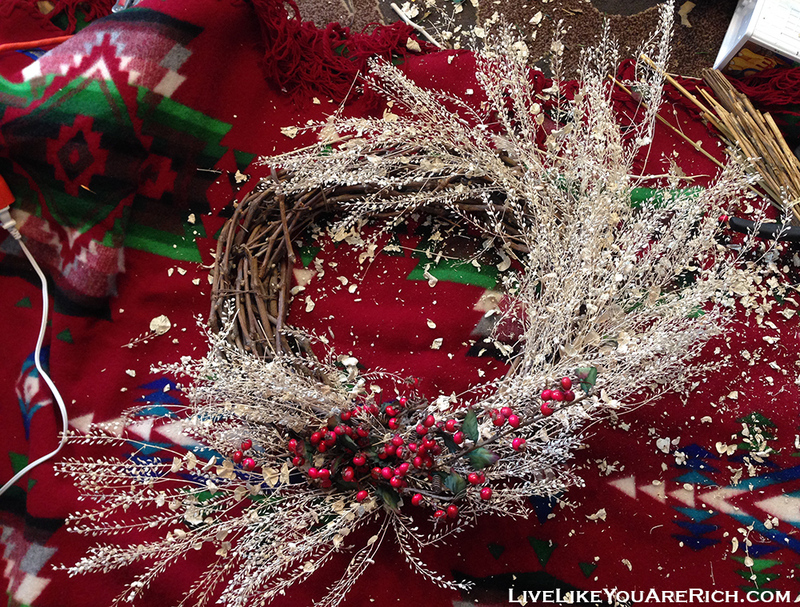 I glued my wreath heavily and it has held up perfectly over 3 months even despite some very windy days. 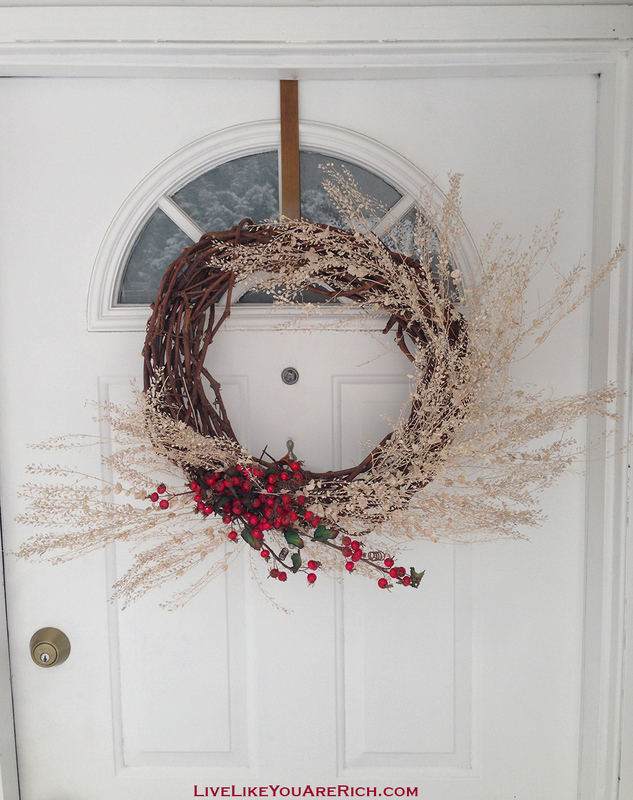 Tip: Make sure to measure your door if you want a wreath that is bigger/wider like I did. You need to make sure the wreath is less wide than the door frames. I gave myself an inch or two on each side and haven’t had any problem with the branches hitting the door frame. 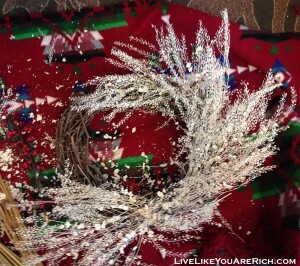 This wreath is an easy inexpensive way to celebrate the winter season. I hope you are as happy with yours as I am with mine! For other ‘living rich tips’ and inexpensive crafts please subscribe, follow me on Pinterest, or like me on Facebook. « How To Decorate Your Christmas Tree Like a Pro.